Whether you’re a first-time user or a long-time consumer, understanding how CBD works and figuring out the best dosage for your needs may be a hard nut to crack, especially now that the industry is in its infancy. Well, it’s no wonder that you’re seeking answers. There are tons of articles about the benefits of CBD and different consumption methods, and yet, little has been said about dosing Cannabidiol. We’re going to start with the bad news. The sooner you come to terms with this fact, the better. Even FDA has not come up with a Recommended Daily Intake (RDI) for CBD, which means that CBD does not have an official serving size. We understand that you might have got accustomed to the message that pharmaceutical companies have been sending us for a long time – each health condition has its own pill that kills it – or, should we say, masks its symptoms? CBD acts on more than 60 molecular pathways, meaning that its relationship with the body and the brain is more complex than we can imagine. It’s impossible to determine a dose that would help any person regardless of their condition . Some companies will provide you with their dosage guidelines, but you have to be aware that these are only general figures that shouldn’t be considered a universal point of reference. While one dropper of CBD per day can definitely be a dosage, there’s no way to tell if it’s the right amount for the given individual because it doesn’t take all important variables into account. How to Determine Your Best CBD Dosage? The severity of your condition. According to neuroscientist Nick Jikomes, as our body undergoes physiological changes, so do the cannabinoid receptors in the endocannabinoid system, which are directly linked to the effects produced by CBD. That being said, optimal CBD dosages can shift throughout your life, so there will never be a universal or static CBD dosage. But hey, you can still figure out how much CBD will be sufficient at the given moment. Here’s a couple of life hacks that can help you find the best CBD dosage for your condition. 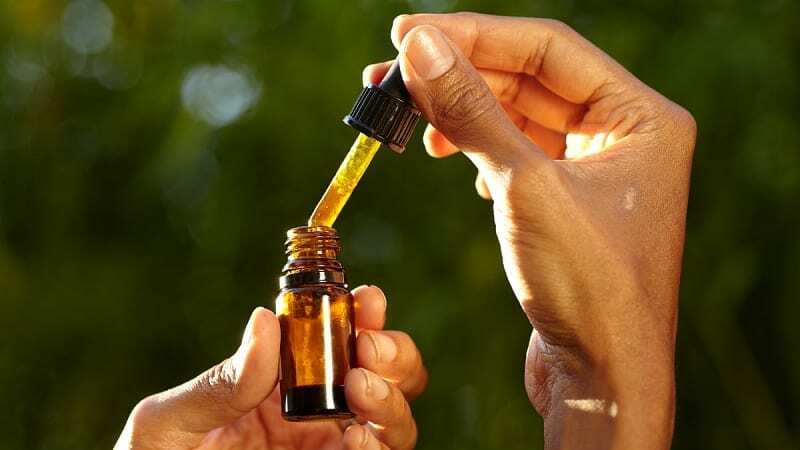 Currently, CBD oil drops rule the roost as the most popular consumption method. They are easy to use and allow you to absorb CBD directly into your bloodstream. If, however, you don’t like the taste of pure CBD oil, you can try vaping products to deliver Cannabidiol and other active compounds via inhalation. Both of the above methods are generally preferred by people who need quick relief from pain, anxiety, or inflammation. Other popular methods include CBD capsules, edibles, and topicals that are rubbed into the skin. If you need a fixed dosage of CBD on a regular basis, capsules will be your best friend. There’s no need to measure out the CBD dosage each time you need to take it, but most importantly, CBD capsules are easy to swallow with water and don’t leave the unpleasant aftertaste on your tongue. However, not all consumption methods are considered equal in terms of dosing Cannabidiol. The actual effectiveness of CBD is determined by the bioavailability of the delivery method. Bioavailability refers to the actual content of CBD that makes it into your bloodstream. To make it clear, consuming 25mg of CBD in oral tinctures will deliver an estimated 4-6 times the amount of Cannabidiol to your body than a capsule containing 25mg of CBD. As you can see, the delivery method can have a huge impact on finding the optimal CBD dosage . Whenever you’re in doubt, consult your physician. It’s worth noting that a cannabis-friendly professional will be more helpful than your regular doctor, so if you can find one somewhere near you, you’re going to receive decent guidance. Most CBD-friendly doctors should have a good understanding of how your body will react to CBD, especially if they know your medical record, not to mention that it’s always wise to consult somebody who has spent pretty much time on medical education before approaching any new substance. Since we are all made differently, and we have our own unique history with the use of particular substances, supplements, medications, and other things we deliver to our bodies, what works wonders for your friend, might not necessarily work for you. Always determine your initial dosage based on your body weight. Starting with baby steps will help you monitor your body’s reaction so that you don’t build a tolerance to CBD faster than you normally would. This, in turn, brings us to the last piece of advice. The best way to figure out the best CBD dosage is to start low and slowly work your way up the ladder until you find the sweet spot. We recommend lower CBD doses at the beginning because if your dose is too high, you may experience undesirable results like nausea or dizziness, let alone the sudden tolerance buildup that is your body’s natural reaction to a dramatic influx of cannabinoids . On the other hand, if the dosage is too low, you may not feel any effects at all, so again – moderation is the key. Using CBD tinctures is easy as a walk in the park. All you have to do is fill the dropper, place a few drops of oil beneath your tongue, hold it there for 30 to 90 seconds, and swallow. But the question is: how to estimate your CBD tincture dosage? To get your answers, you will need to know how much CBD is in a dropper. Typically, a dropper can hold 1 ml of liquid. If you know the volume of your CBD tincture, you can use some simple mathematics to determine your CBD dosage. [Total CBD in the bottle] ÷ [Number of milliliters in the bottle] = MGs of CBD in a dropper. While this isn’t a 100% surefire method, it’s definitely more accurate than shooting blinds or basing your dosage on your friend’s recommendations. Keep in mind to always start low and gradually increase your intake of CBD until you find the ideal dosage. You can vape CBD by using CBD e-liquids, CBD cartridge systems, or CBD concentrates. All of those methods are fairly easy and offer a pleasurable experience. When using CBD e-liquids, you will need to start by determining how much CBD is in a dropper – similarly to tinctures. Once you figure this out, you know how much CBD to put in your vaping tank. As you puff the vapor throughout the day, watch your tank and see how many times you need to refill the device. If your CBD dosage is 25 mg, and the bottle of your CBD e-liquid contains 1000mg of CBD, a single tank would hold about 33.33mg of Cannabidiol. Thus, a single tank would do the job when vaped throughout the day. As we said, there are general dosage guidelines that you can use for specific conditions. After years of research, scientists are finally able to put the CBD dosage in some kind of a framework. This allows patients to get a relatively good point of reference for determining the perfect amount of Cannabidiol. Cancer patients who struggle with nausea or the lack of appetite are advised to take 2.5mg of CBD combined with 2.5mg of THC for improved effects. In some cases, CBD alone can help alleviate the above conditions, but the synergy achieved by both cannabinoids is essential for maximizing the effectiveness of any CBD product . The optimal dosage for people with chronic pain can range between 2.5-20mg of CBD when administered orally, with or without THC. Patients with epileptic disorders need extremely high doses of Cannabidiol, anywhere between 200 and 300mg. CBD is known to reduce stress and anxiety while easing pain and inflammation at the same time. All of the above factors can destroy the quality of your sleep, so depending on their frequency, you might need between 40-160mg of CBD daily to experience the desired effect. According to one study on social anxiety, which has been replicated many times since the study’s publication, a dosage of 40mg of sublingual CBD can significantly reduce social anxiety, although in specific cases, this amount can increase up to 300mg of Cannabidiol . Yes, CBD is safe for human consumption. No doses of CBD, even as high as 600mg, has been shown to cause toxicity in clinical subjects. No, overdosing on CBD is virtually impossible. Given the litany of side effects caused by prescription drugs, it’s a very small price to pay for. What Is the Most Effective Way to Take CBD? When it comes to the efficacy of CBD, oil tinctures or vaping products will be your best bets, as they offer the highest level of bioavailability. What’s Better: A CBD Isolate or Full-Spectrum Extracts? If you’re not allergic to CBD – which would be a very rare case – we suggest that you use full-spectrum CBD because of the “entourage effect.” The entourage effect refers to the synergy between all active compounds in cannabis, including cannabinoids other than CBD and THC, terpenes, and various flavonoids. In short, full-spectrum extracts require less CBD to take effect than a pure isolate. Although cannabis and animals don’t look good together in one sentence, CBD is actually safe for them. It’s THC, the intoxicating cousin of Cannabidiol, which produces toxicity in animals. If you want to give hemp-derived CBD oil to your buddy, you’re good to go. As you can see, there is no such thing as the ideal CBD dosage for everyone. The nature of Cannabidiol is complex itself, let alone its relationship with the human endocannabinoid system. There are so many outside factors that can make or break CBD’s absorption: the concentration of cannabidiol, its bioavailability, your weight, unique body chemistry, the severity of your condition – they all matter. Although there are some general CBD dosage guidelines for specific health conditions, the best way to determine the ideal amount of Cannabidiol for your needs is… to experiment – simple as that. Start with low doses and gradually increase your CBD intake until you hit the sweet spot. Remember that the way you react to cannabinoids can change over time, so observation is of the paramount importance, too. But above all, look for a cannabis-friendly physician who could guide you on CBD dosage based on the scientific evidence and their professional experience. What CBD dosage works for you? How much CBD do you take on a daily basis? Share your stories! Atakan, Zerrin. “Cannabis, a Complex Plant: Different Compounds and Different Effects on Individuals.” Therapeutic Advances in Psychopharmacology 2.6 (2012): 241–254. PMC. Web. 22 Sept. 2018. Huestis, Marilyn A. “Human Cannabinoid Pharmacokinetics.” Chemistry & Biodiversity 4.8 (2007): 1770–1804. PMC. Web. 22 Sept. 2018. Iffland, Kerstin, and Franjo Grotenhermen. “An Update on Safety and Side Effects of Cannabidiol: A Review of Clinical Data and Relevant Animal Studies.” Cannabis and Cannabinoid Research 2.1 (2017): 139–154. PMC. Web. 22 Sept. 2018. Parker, Linda A, Erin M Rock, and Cheryl L Limebeer. “Regulation of Nausea and Vomiting by Cannabinoids.” British Journal of Pharmacology 163.7 (2011): 1411–1422. PMC. Web. 22 Sept. 2018. Crippa JA et al. Neural Basis of Anxiolytic Effects of Cannabidiol (CBD) in Generalized Social Anxiety Disorder: A Preliminary Report. Journal of Psychopharmacology (2011): 121-30. Published online in September 2010.